The goal of VanSplash is to develop a 25-year vision for the future of aquatics in Vancouver, in anticipation of a changing and aging population. VanSplash expands the definition of aquatic services to include not only indoor and outdoor pools, but also beaches, wading pools, and spray parks. Following a call for volunteers in late 2018 and short-listing by an independent facilitation consultant, the Board of Commissioners appointed 20 individuals with a diverse range of backgrounds and interests in aquatics to a new VanSplash Advisory Group. The group meets regularly to learn about Vancouver‘s existing aquatic system, review the draft strategy and other comments received, and provide input on the draft VanSplash Strategy. This input will inform the revised final draft VanSplash strategy that will be presented to the Park Board for decision in late 2019. If you have questions about the work of the advisory group, email vansplash@vancouver.ca. The advisory group was established based on the guiding principles of respect, collaboration, and a city-wide approach. The group worked together to develop operating values and finalize the group’s terms of reference. Through an open call to apply to join the VanSplash Advisory Group, a netural third-party facilitator received 256 completed applications which they vetted based on a detailed selection process. The advisory group represents residents from across the city and includes stakeholders from key aquatic areas including fitness, recreation and leisure, competitive and sport training, skill development, and therapy and rehabilitation. Approximately seven to eight meetings will be held between January and July 2019, as well as and all-day aquatic facilities tour. In 2016 and 2017, more than 7,000 people weighed in on the future of our pools and beaches via surveys, in person meetings and social media. Based on this input staff developed the Draft VanSplash Final Strategy report PDF file (138 MB). This report outlines the proposed key recommendations for the proposed 25-year vision, with a 10-year phased implementation plan. 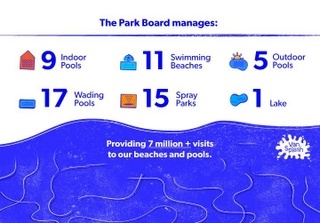 Get to know the 9 indoor pools, 5 outdoor pools, and 11 swimming beaches managed by the Park Board in this slideshow. We also care for 17 wading pools, 15 spray parks, and 1 lake. New facilities in recent years, like Hillcrest Aquatic Centre, have also increased the number of annual swims. This 25-metre pool in Grandview-Woodland has a 1-metre diving board, rope swing, and small slide. It was built in 1975 and renovated in 1998. The facility is wheelchair accessible and also has a leisure pool, whirlpool, sauna, steam room, family change room, and fitness centre. This 50-metre pool in Riley Park has a 1- and 3-metre diving board, 5-metre diving platform, beach entry, universal change rooms, movable floor, and 2 bulkheads that split the pool into different sections. It was built in 2010 as part of the Winter Olympic Games. The destination facility is wheelchair accessible and also has a leisure pool, lazy river, outdoor pool with spray features, whirlpool, steam room, sauna, fitness centre. This 15-metre leisure pool in Kensington has a whirlpool, sauna, and fitness centre. It was built in 1979. The facility is wheelchair accessible. This 30-metre pool in Kerrisdale has a 1-metre diving board and small slide. It was built in 1955 and renovated in 1996. The facility is wheelchair accessible. This 25-metre pool in Killarney has a 1-metre diving board and 3-metre diving platform. The adjacent 15-metre leisure pool has spray features, a lazy river, large slide, whale tail, bubble pit, and climbing wall. It was built in 2006. The facility is wheelchair accessible and also has a whirlpool, steam room, ozone-treated water, universal change rooms, and fitness centre. This 25-metre pool in West Point Grey has a diving board, rope swing, and small slide. It was built in 1974. The facility is wheelchair accessible and has a whirlpool, sauna, and fitness centre. This 25-metre pool in Renfrew has a 1-metre diving board, small slide, and bubble pit. It was built in 1963 and renovated in 1970 and 2005. The facility is wheelchair accessible and also has a whirlpool, sauna, family change room, and fitness centre. This 25-metre pool in Hastings-Sunrise has a 1-metre diving board, rope swing, and small slide. It was built in 1974. The facility is wheelchair accessible and also has a leisure pool, whirlpool, sauna, and fitness centre. This 50-metre pool in the West End has 1- and 3-metre diving boards, 5-, 7.5-, and 10-metre diving platforms, a rope swing, small slide, and movable bulkhead. It was built in 1974. The facility is wheelchair accessible and also has a leisure pool, dive tank, whirlpool, sauna, family change room, beachers, and fitness centre. This outdoor pool has spray features and is open during the summer from Victoria Day to Labour Day. This 137.5-metre pool in Kitsilano has 50-metre lanes, 3 small slides, beach entry, and salt water. It was built in 1979. The destination facility is wheelchair accessible. This free-form family leisure pool in Kerrisdale has beach entry, 4 feature fountains, and a 1-metre depth. It was built in 1995. The facility is wheelchair accessible and has changerooms and a café. This 55-metre pool in Hastings-Sunrise has 25-metre lanes, beach entry, and a small slides. It was built in 1973. The facility is wheelchair accessible and has change rooms and a concession. This 110-metre pool in Stanley Park has 50-m lanes, 3 small slides, and beach entry. It was built in 1995. The destination facility is wheelchair accessible and has change rooms and a concession. Downtown's busiest beach next to the Seawall has a concession stand, Cactus Club Cafe, public washrooms, beach umbrella and chair rentals, kayak rentals, a swimming raft with a large slide, 2 sand volleyball courts, and a beach wheelchair. Between Kitsilano and West Point Grey, Jericho Beach caters to people swimming, sailing, and windsurfing. The beach has a concession, public washrooms, playing fields, tennis courts, picnic tables, a swimming raft, a beach wheelchair, the Jericho Sailing Centre, and the Vancouver-Jericho Beach Hostel. Kits Beach is connected to the Seawall and has a concession, the Boathouse Waterfront Restaurant, public washrooms, tennis and basketball courts, a playground, and a swimming raft. This quiet beach between Jericho and Spanish Banks beaches has a concession, public washrooms, 6 volleyball courts, picnic tables, a swimming raft, and free parking. Near the Seawall, English Bay entrance to Stanley Park, and Ceperley Meadow, Second Beach has a concession, public washrooms, a playground, and a picnic shelter that you can reserve. The longest and widest beach in Vancouver has 2 concessions, public washrooms, picnic tables, 16 volleyball courts, free parking, 2 dog off-leash areas, and a kiteboarding launch zone. At the entrance of False Creek downtown, this quiet beach has a concession, public washrooms, and access to False Creek Ferries and Vancouver Aquatic Centre. Shielded from city noise, Stanley Park's Third Beach has a concession and public washrooms. In Grandview's John Hendry Park, Trout Lake Beach has a concession, public washrooms, a swimming raft, a picnic area, a dog off-leash area, playing fields, and free parking.